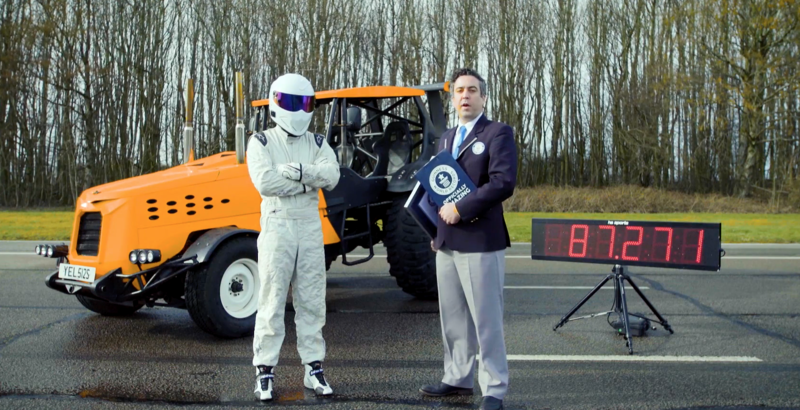 Top Gear’s famous helmeted test driver – The Stig – has set a new Guinness World Record for the fastest tractor. 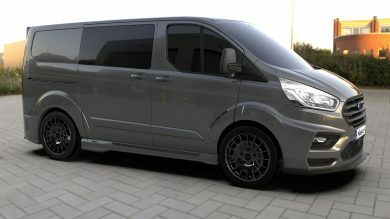 The modified farm machine – known as ‘Track-tor’ – managed to hit 87.2mph on the show’s famous test circuit, thanks to its 5.7-litre Chevrolet-sourced V8, which churns out 500bhp. It also features adjustable air suspension that can raise or lower the tractor’s body, as well as four-wheel brakes – normal tractors traditionally only have brakes on the rear axle. 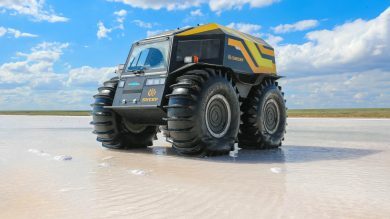 Large 20-inch split rim wheels are shod in 54-inch ‘Super Swamper Bogger’ tyres, and the front and rear lights come from the Ariel Atom lightweight sports car. It even features a twin hydraulic handbrake, which can independently brake each rear wheel, giving the tractor better cornering characteristics. Practicality was still kept in mind, however, as the tractor was fitted with a rack for wellingtons, as well as one for a garden spade. Jack Brockbank, official Guinness World Records adjudicator, said: “To see The Stig hurtle past me in a tractor at 87mph was surreal, but hugely impressive. The Stig’s attempt managed to beat a previous record-breaking run, which saw a tractor hit 80.87mph in Vuojarvi, Finland, in February 2015. Track-tor’s epic run was shown on Top Gear on BBC Two last Sunday, and can be viewed on BBC iPlayer in the UK.